I’ve grown used to the constant rhythm of when the FN is running smoothly. If the sounds change ever so slightly and I find myself adjusting the throttle and air lever, I know that there is contamination in the carburetor jet. If the engine doesn’t respond and hiccups instead, I know the inlet valve springs are collapsing. I can gauge how much lubrication the engine is getting by the amount of oil specks that cover my right boot. The oil from the clutch ends up on my left boot within the first 5 or 6 kms in the morning depending on how much clutch usage. When I apply the back brakes using the pedals this puts load on the brake pawl, which is basically a ratchet for the pedaling device. Constant usage of the brakes riding through towns, wears out the pawl so I carry a spare then get the old one welded at the next opportunity. It can be pretty scary to apply the brake in city traffic which is always horrendous and find that nothing happens. So most times I try to use the engine decompressor to slow the engine. The noise I fear the most though is the big bang of the back tyre! Despite all the interest from passersby, it’s a lonely journey at times and I often find myself talking to the bike that I’ve aptly named Effie. She and I chatter away coaxing one another to go a little further before the next rest stop. Every time we take a break I drain the oil from the distributor that seeps through from the camshaft spindle in the timing case. I do this because there’s no proper seal. There used to be one and it worked very well but didn’t last. It’s necessary to make sure I turn off the oil and disengage the rear brake in case someone should move the bike backwards and lock up the rear wheel. Come the end of the day I dismantle and adjust all inlet valve springs. This has been a real learning curve given rides in Australia were very short in comparison. Because of the amount of luggage strapped on and the difficulty in putting down the rear stand I usually leave everything intact and park the FN against a post. And so how do I take care of myself? Well I’ve working on that. In the beginning (was it only just over one month ago?) I skipped meals during the day, but I’ve now got into a much better routine – a good breakfast, at least fruit during the day, camp up before I get exhausted, have a shower whenever possible and a good meal. There’s times when this all goes out the window, because life on the road is unpredictable, but I’ve learned that taking care of my body’s needs makes a real difference in how I see the journey. Riding after dark is something we all say we won’t do, and invariably end up doing anyway, usually because something’s gone wrong during the day. Years ago I used to take the risk, pushing myself beyond tired, but a rope pulled across the road in the dark one time in Bolivia soon showed there’s things we can never predict. With no set agenda I’m taking it one day at a time and loving it. That way I can really enjoy the music. I found out about you from my brother who has the web classicmoto-cycles blog and found your journey very interesting, so I was just quietly following along (until now). He is interested in the Cannonball Endurance Race from New York to California on old classic motorcycles and bought himself an old 101 Scout. Something like an endurance race with its lot of challenges. Traveling on the Karakoram Highway would be very exciting. Isn’t just the Pakistan part about 500 miles long? Would you go into China? I know, I used miles, but I live in the United States of California, heh. The altitude there is very extreme so the air is very thin. It might take you a couple of days to acclimate to such altitudes. So please take it easy when you first get there. Wish you a safe jouney! Sorry for the long delay in responding. Love the classicmoto-cycles blogspot – some amazing restorations. Getting my FN back to new will give me another project when all this is over! What a shame the Cannonball Endurance Race isn’t held a month or two later as it would have been a perfect way to finish off on my way around the globe. I’ll follow it with interest. My experience on the Karakoram is about to be posted – certainly not what I intended but there you go, that’s what it’s all about, being open to anything. And yes, the distance is pretty long, even just within Pakistan. I didn’t consider going into China this time around. You’re right, the altitude takes a bit of getting used to, much like Nepal. Thanks for your good wishes and enjoy the blog. This is John Williams from Henderson, NZ. I’ve just started to watch your journey after seeing it in the Class Motorcycle, March issue. 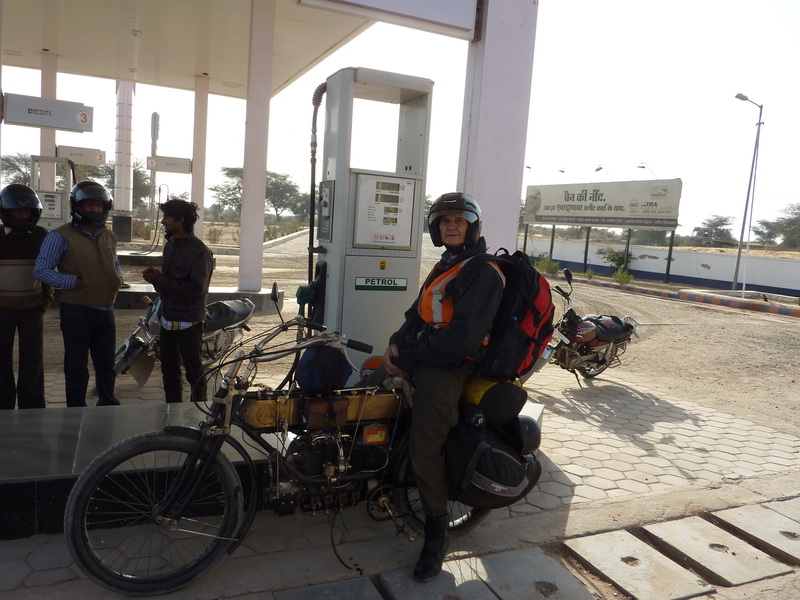 A few years ago I spent a few weeks riding a bike in India, so you’re bringing all the noise, smells etc back to me. I wish you good luck and good fortune on your journey. Will inform other people in the Henderson area who know you, about your journey. Great to have another Kiwi on board. What bikes do you have & did you hire an Enfield for your ride in India? Quite a few riders seem to do that and I saw a good number of these bikes owned by local riders. I loved the sound of them – it brought back lots of memories of my younger days. A lovely post. May you and Effie continue enjoying music together! We will Fi & thanks for the hug. Hope all is good on the island. Hi Ron, don’t stop talking to Effie (and writing for everybody to read !) but watch out if Effie answers !! All’s well. Thanks for sharing & hope you continue to enjoy the ride with me. Good to hear from you. Sounds like talking to yourself runs in the family. Try and talk the brother into reading the blog. He might even enjoy it! I’m taking time out in Lahore with really great people. I might never get back on the bike at the rate they’re feeding and taking care of me! Lynne’s back in Brisbane sorting out a visa so she can join me again in April. India was a nice surprise for us both and I know she’ll love Pakistan. She got some outfits made before she left India to blend in with the locals. We did stand out at the Golden Temple, but got only friendly stares. Being covered up will help her feel less conspicuous and the stricter rules from a few years back are being relaxed from what we’ve read. Thanks Paul Louis for your good wishes. I remember some great rides in California many years ago on my GoldWing, especially around Ferndale and San Francisco. If Effie & I arn’t too burnt out by Sept I might even ride back home via the US, we’ll see. Lots of adventures ahead. Glad to have you & other Honda members sharing the journey. Hi Ron, and Lynne if your listening. We are still ‘traveling’ with you and will continue to do so till you reach your destination. We’ve just read your mechanical daily routine and concluded that very few people in this world today would be aware, or even think about, the daily rituals of old vehicles (because we don’t have to). Thanks for reminding us and taking us back to a time when this was probably common place. NOT THAT ANYTHING YOU’RE DOING IS COMMON PLACE…!!! We can’t wait to travel with you to Pakistan and Iran. Continue to enjoy (is that the right word?) and stay safe. Lynne and I are both tuned in. Good to hear from you. Has the Zundapp arrived in Tassie yet? I imagine you both know what it’s like doing all the daily maintenance and i remember you picked up on the different “sounds” on your trip. Thank god my hearing hasn’t gone completely or I’d really be in the poo! You have to put Pakistan on your places to visit list. I’ll look out and see if there’s any Pakistani bikes you could add to your collection. I know how much you love sourcing rare machines. Hoping to get to do the KKH road, but on something more suitable than the FN. Would need to fly up there but have plenty of time while i wait for Lynne to return. I know what you mean about “enjoying” the experience. There are times when it become a bit hard, but that passes and then it’s always the people who make it worth the effort. Good to have you on board. We’ll be posting the latest news as soon as we can both get ourselves sorted. Hope you’re getting plenty of good riding weather. Love to you both. again a nice reading. Taking care of the bike is surely essential, especially for a bike, which is more than a 100 years old. Seems you have reached Pakistan. Hope the Tires and spares will last up to Tehran. Save riding ! I’ve been in Lahore a few days and had a great welcome from the Pakistan Bikers Club. Can’t say enough about their hospitality and kindness. The tyres haven’t given me any more trouble so here’s hoping they last till Tehran. Should have my Iran visa by tomorrow (Tuesday). Everyone in the embassy very friendly and helpful. Only the paperwork takes time, but then I’ve got plenty of that. Lynne say’s she’s spoken to you about the house sit. I’m hoping she can get a visa to join me again in a few weeks and I know she’ll be sorry to miss out on the chance to spend some time on the Gold Coast. We’re having long phone conversations, messaging and sending photos as there’s a lot happening and consequently heaps for me to relay back for the blog. Nothing like our last trip when we sometimes didn’t even have a map! Hoping to get the opportunity to head north and do the KKH road on the border with China and Afghanistan, but not on Effie. Have to leave her behind for this ride as it’s pretty tough going apparently. I’m looking at hiring a bike as I’ve been told it’s amazing. Am checking out how feasible it is and will know in a day or so. Meanwhile just finalising the Iranian visa. Great motorcycle club here in Lahore Cooz and they’re really looking after me. My regards to all the family. Love you guys. You amaze me, as does the FN. I have got my 1912 out of the back of the garage, and intend to run it this summer. I didn’t really think it was that usable. Doesn’t the 1912 have the bigger engine? Great to hear that you’re intending to run the bike this summer – good for you! You’ll be surprised what you can do once you work out all it’s little quirks. Not the easiest bike in the world to ride but fun. I look forward to hearing you’ve been out and about on it. Thanks for your good wishes. Pete Gagan…you gotta do a story in an upcoming Antique Motorcycle Club of America on Ron….it is really amazing this adventure riding on Antiques…bet you won’t see to many of the bikes from the Las Vegas Auctions doing what Ron is doing…is has now set the bar one higher! You really are my hero! “A Smile…” was just the most heart-warming post ever. Would this be the longest time you and Lynne have ever been apart? It must be lonely – hope Lynne has had some luck with the Iranian visa. I’d love an update on your tyres – did you get the replacements? Can’t believe the amount of work you have to do for the bike when you are no doubt exhausted by the end of a day’s riding! There’s nothing heroic about having fun, but I do recommend it. Lynne’s been with me off and on for the past month and has just gone home to get her visa for Pakistan and Iran. Getting together between the long rides makes it easier. She does a good job of translating all my notes into something more readable. LOL Some wonderful guys in Europe who’ve been following the blog have arranged the tyres for me and they will be shipped to where ever I am when I need them. I’m hoping the ones I have last til Tehran. I’m having a few days in Lahore sightseeing before continuing the ride. Been meeting fantastic people here in Pakistan who’ve really been very kind and hospitable. Don’t worry, everyone’s taking care of me! !